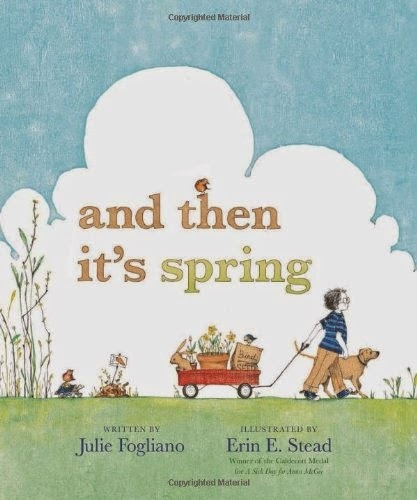 Grab a blanket, find a nice sunny spot outside, and read some of these sweet Books About Spring And Changing Seasons. 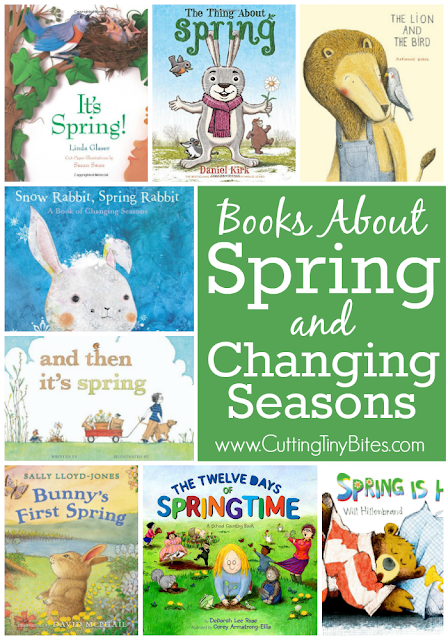 Children LOVE all the changes that that come with springtime, and reading about them will help them notice all that's happening around them! 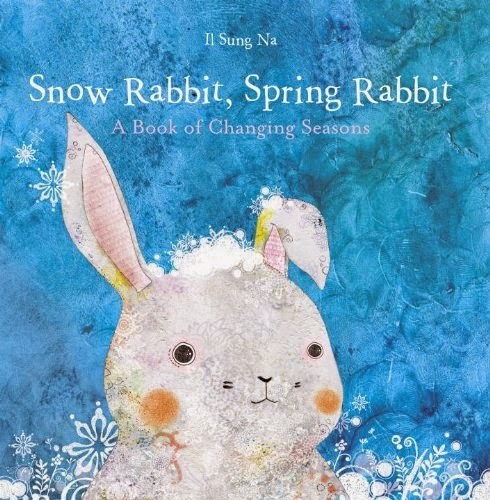 Snow Rabbit, Spring Rabbit is actually more about what animals do in winter than springtime, but spring does appear in the end of the book! I was completely impressed by the way the illustrations are able to be so bright and cheery while still conveying how life seems to slow down and be a bit more dreary in winter. This book is a treat for your eyes! This may be the sweetest book of the batch. Towards the end of summer, Lion takes care of an injured bird who is unable to fly south with his friends. They spend the fall and winter together, becoming friends. When spring returns, the bird is able to rejoin his flock. 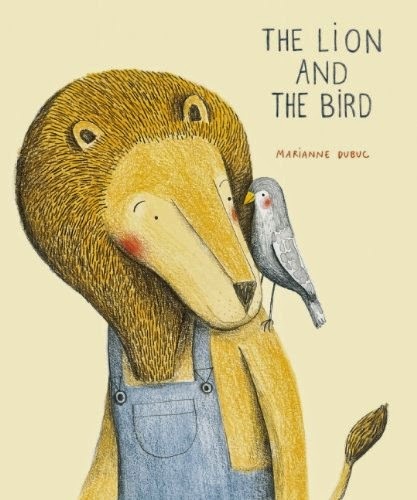 Lion misses him throughout the spring and summer, but Lion and Bird are able to stay together again when winter returns. This story is told mostly through illustrations- the text is sparse, but that makes the story even sweeter! This book is like a work of art! Susan Swan completed the artwork for It's Spring! by using 3-d paper collage, and each page is simply beautiful! 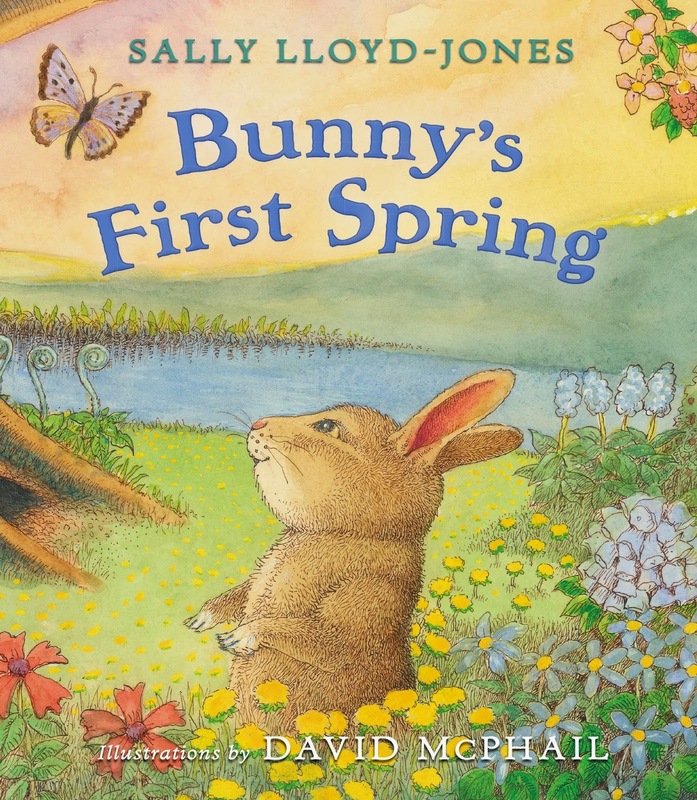 In addition, I love the gentle way the text of this book covers so many wonderful things about spring. Children will learn about birds returning, buds on trees forming, creeks flowing more strongly, and bullfrogs singing. One of my favorite parts about this book is a list of suggested nature activities for children to do in spring- it will give you some great ideas of things to do with your children. The text of this book mimics the Christmas song, "The Twelve Days of Christmas." 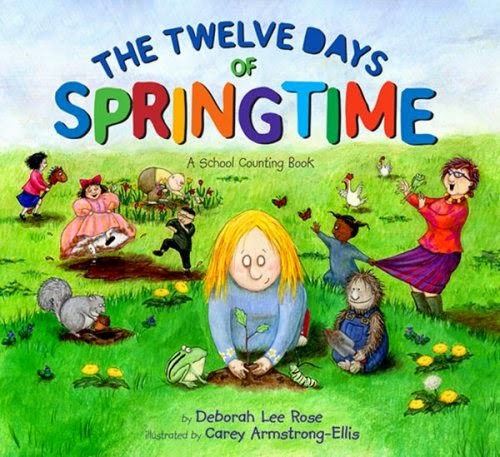 In this case, however, a teacher is introducing her students to different elements of springtime. They explore gardening, ponds, ducklings, and insects. What makes this book so much fun is the crazy antics of the students! They get into all sorts of trouble, and the teacher's facial expressions will have your kids laughing! The bright and detailed illustrations really make this book shine. A young bear is so anxious for his first spring that he can't settle down to hibernate when it is time. Instead, he goes out looking for spring and mistakes some of the exciting changes of winter for spring instead! After his body finally settles in for a long winter's nap, he is surprised to find actual spring when he awakes. The cut paper collage artwork in this book is very interesting; I enjoyed asking my girls what they saw and how they thought the pictures were made. And Then It's Spring is about a little boy who plants some seeds in the brown ground and waits patiently for weeks and weeks. Everything stays brown. Eventually, the world turns green again! I love the soft and simple illustrations in this story. It's a great book about patience, and a wonderful way to teach children that sometimes things are happening underground or in the air that we can't see, but that are making big changes happen! 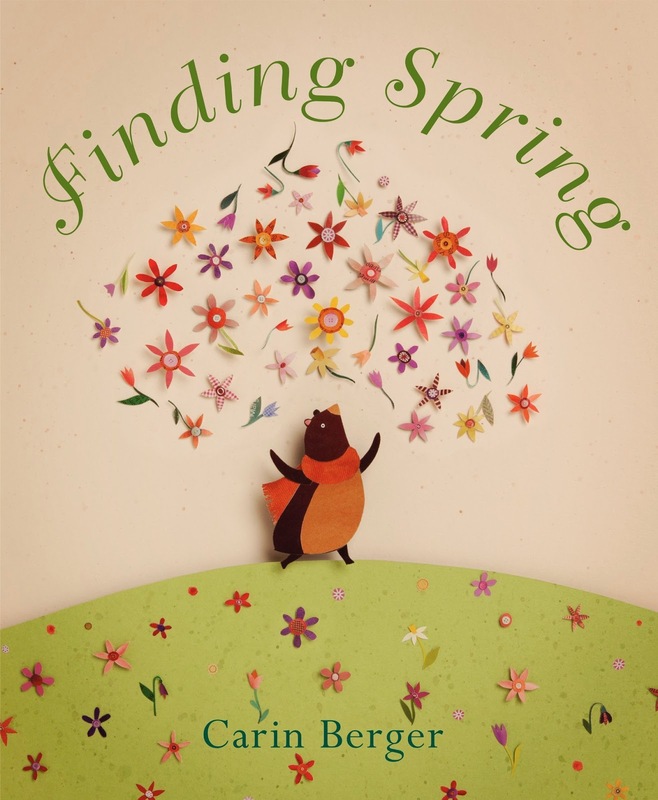 Spring Is Here is a cute story about two friends, Mole and Bear. Mole wakes up from his winter hibernation first, and tries with all his might to wake Bear to tell him that spring has arrived. Nothing works- Bear just keeps snoring. Finally, Mole works furiously to cook a big breakfast for Bear which does the trick but instead tires out Mole who then becomes the snorer! 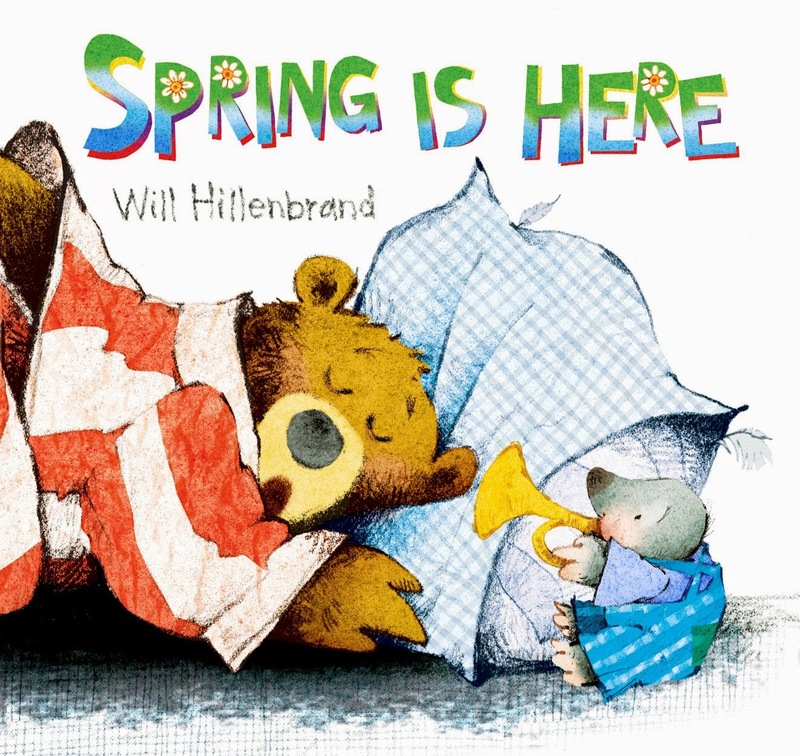 The bold colors and cartoonish illustrations are a nice change from some of the other "soft and sweet" books about spring! A baby bunny, born in the spring, experiences the summer, fall, and winter. He is confused and wonders if the earth is dying. The bunny hibernates with his parents and awakens to spring again! This book isn't written in rhyme, but does have a very poetic quality to the text. The illustrations are soft and sweet, and perfectly capture the mood of different seasons. This is a cute story! A little girl awakens in the night to a crinkle-crackle sound. When she looks out the window, she sees a bear telling her that, "It's time"! They travel through the forest together, gathering other animal friends as they go. Finally they arrive at a giant egg about to burst open with springtime! 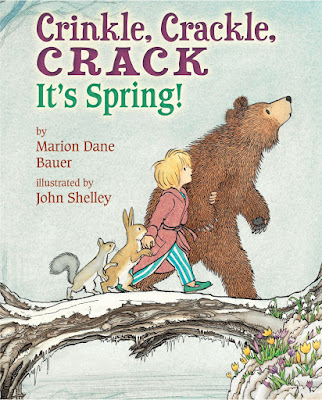 The illustrations in this story are adorable, and snow the subtle signs of winter ending and spring beginning. A quartet of friends notices all of the changes that come along with spring. 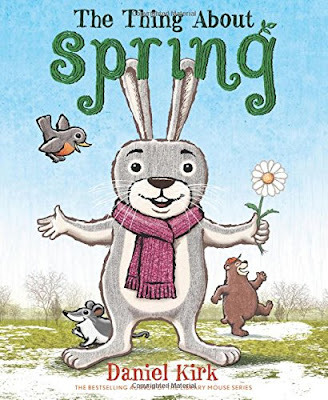 Rabbit is not so excited about his favorite winter things going away, but his friends are able to convince him that there are good things about spring, too. The characters in this book are so friendly, your kids will love them! This super cute book is great for toddlers, preschoolers, and elementary kids. 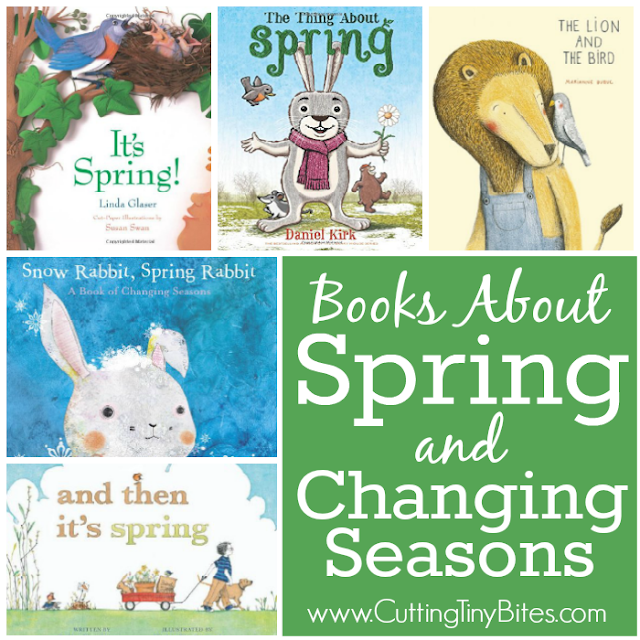 Books About Spring and Changing Seasons. 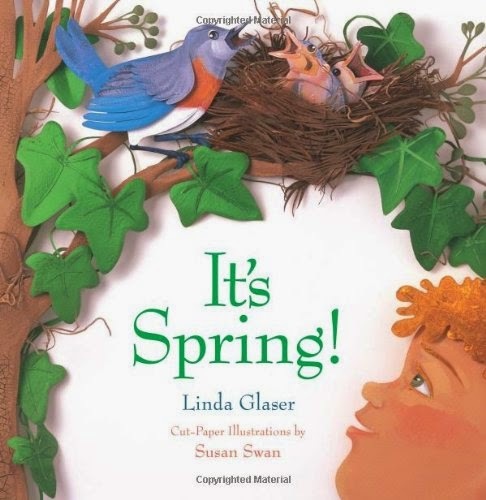 Children love learning about spring- these books will help them learn all about how animals, plants, and the weather all change during springtime. Choices for toddlers, preschoolers, kindergarten, and elementary children.